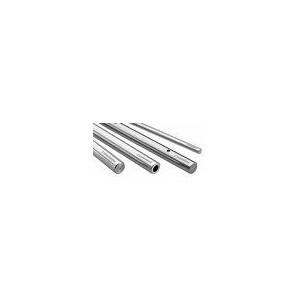 Linear precision shafts are elongated, rod-shaped devices that provide linear or rotary motion for power transmission applications. Precision shafting provides the highest degree of overall accuracy, concentricity, straightness and surface perfection. Utilizing precision shafting greatly increases bearing and system life. Precision shafting is available in an assortment of diameters, including inch and metric, and can be supplied at either standardized lengths or can be cut to length. The tolerances of precision shafting are divided into three main classes, L, N and S. Precision shafts are made of alloy steel, carbon steel, or stainless steel, and then case-hardened, through-hardened, or annealed. Please contact Bearing Service to assist in recommending the right precision shafting for you application.